Russia’s military build-up in Syria is showing no signs of slowing down with Moscow adding significant air power to its growing array of assets along a stretch of coastline still controlled by Syrian President Bashar al-Assad. According to a U.S. official speaking to VOA on the condition of anonymity, Russia now has 28 attack aircraft at the Bassel al-Assad air base near Latakia, up from four confirmed aircraft on Friday. The contingent includes 12 Su-25 “Frogfoots,” 12 Su-25 “Fencers” and four “Flankers.” Imagery experts at AllSource Analysis identified the “Flankers” as Su-30s. The U.S. official said 20 Russian attack and transport helicopters also are being stationed at the base, up from eight on Friday, and that additional tanks also had been brought in. In addition, the official confirmed reports that Russia has begun flying drones on reconnaissance missions, as first reported by Reuters. 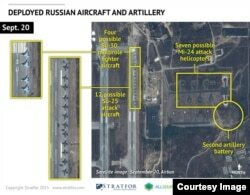 U.S. officials said previously that Russia was landing about two cargo flights a day at the air base and has enough modular housing for up to 2,000 troops with about 500 naval infantrymen already on the ground. The build-up of Russian forces in Syria has raised concerns those forces could come into conflict with the air campaign by U.S. and coalition forces targeting the group known as the Islamic State. U.S. Defense Secretary Ash Carter spoke Friday with Russian Defense Minister Sergei Shoygu. The two agreed to continue talking in order to establish “mechanisms for de-confliction” to prevent any accidental military engagement, but the Pentagon said Monday those talks remained in the early stages, and there were no “next steps” to announce.